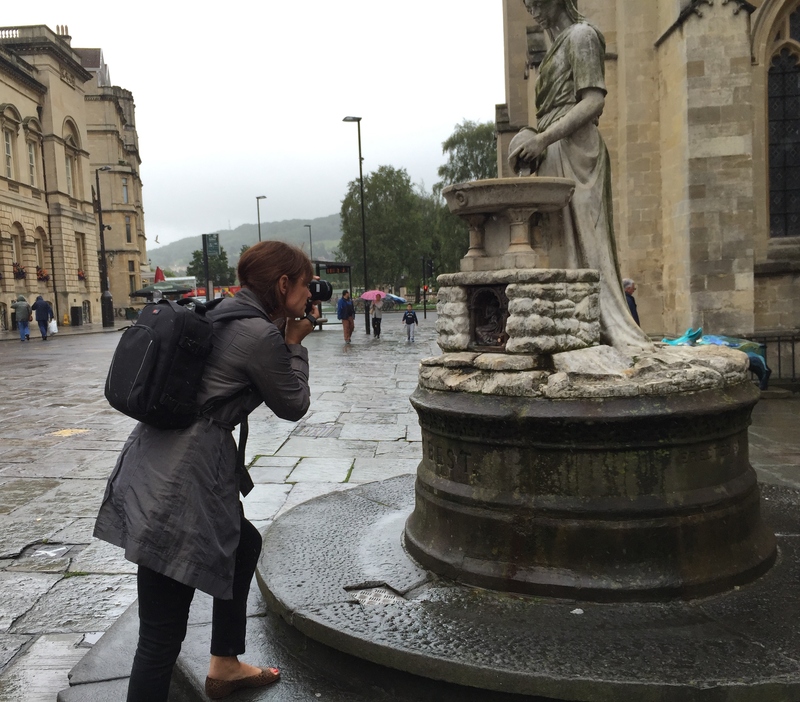 An invitation from the Royal Photographic Society to hold our volunteer photographer training session at their headquarters was too good to refuse, so on 25 August a group of us travelled to Bath to set up our second pilot project. During the Your Sculpture Delivery Phase we plan to set up a volunteering and training programme, a major part of which will be recruiting volunteers from across the UK to photograph monuments and sculpture out in the public realm. 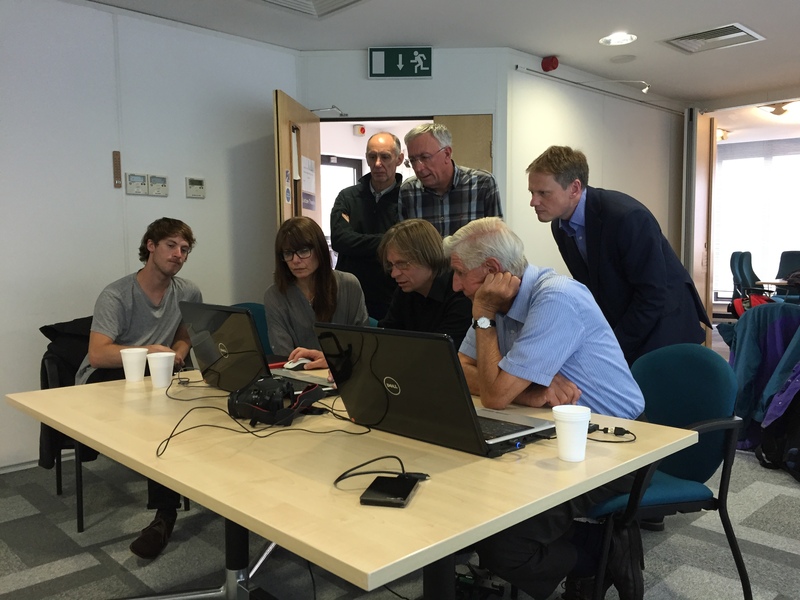 The training day in Bath was held to introduce the project to two willing volunteers who had kindly offered to be our Development Phase guinea pigs. The programme for the day included introductory talks in the morning, followed by a practical photography session in the field after lunch, then a further practical session back at the RPS to cover image processing. At one point we thought our outdoor session might be threatened by the weather, but we decided not to let a bit of drizzle hold us back and went out anyway. I spent some of this session holding an umbrella over the volunteers, to keep their cameras as dry as possible until the rain stopped. Our volunteers are R. Keith Evans FRPS, who is based in Kent, and Nikki Hazelton, from Essex. We are very grateful for their help. Having discussed the project at the meeting they will now spend a few days taking photographs of public sculpture in their own areas. We look forward to seeing the results and hearing back from them on how they have found the process. Their input into the development of the project will be very useful. Key lessons learnt from the training day: choose the best time of day to take your photos (it was very busy in the early afternoon in Bath despite the bad weather) and try not to do photography in the rain (unless you have a friend to hold the umbrella). The project development phase took me to Edinburgh last week, a beautiful city full of monuments, sculpture and impressive architecture. In between meetings I spent some time exploring streets that I’d not visited before and discovered some real gems. This is very much a personal top five list. 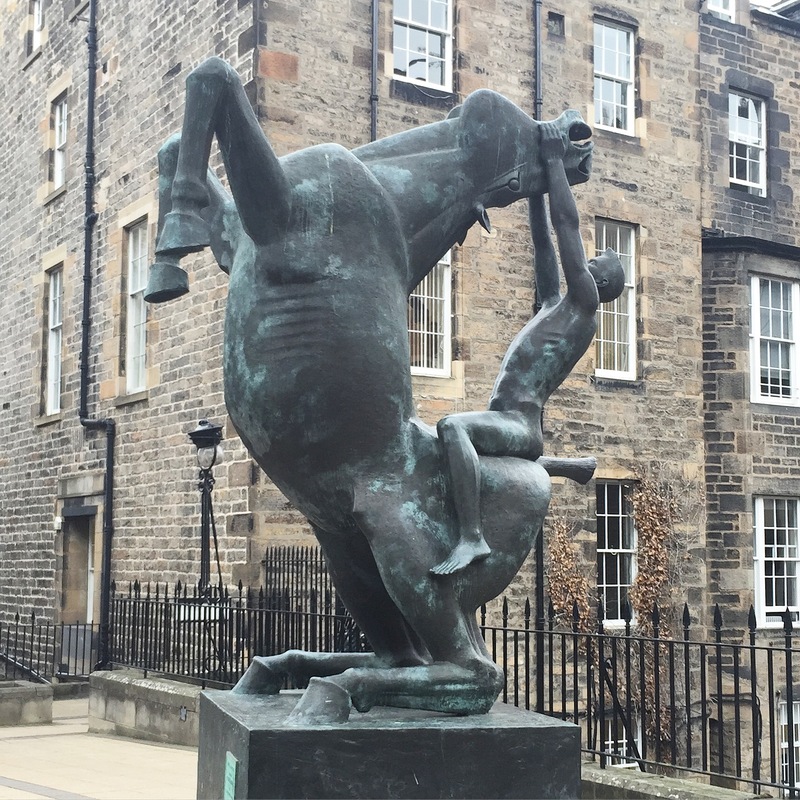 If there are other public sculptures in Edinburgh that you particularly like, feel free to let us know what they are and why you like them. 5. Lion of Scotland, Ronald Rae, 2006, St Andrew Square Garden The lion is a traditional symbol of Scotland and this huge granite version is carved from a twenty-tonne boulder of pink Corrennie granite from Aberdeenshire. The work took Ronald Rae a year to complete. 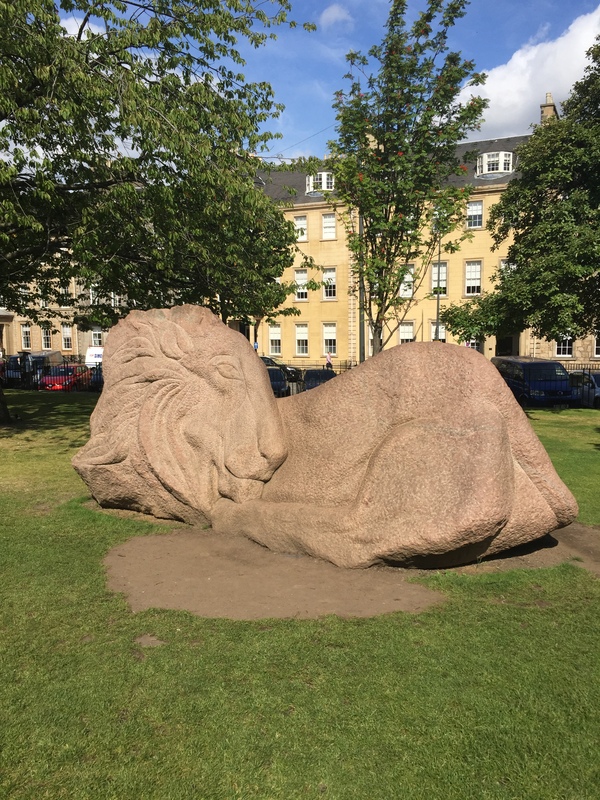 The sculpture currently sits in St Andrew Square Garden, having been moved there from Holyrood Park in 2010. The garden was busy on the day I visited, with people relaxing on the grass in the sun, and the sculpture seemed to be a popular attraction. It’s currently on loan to Essential Edinburgh, but with the hope of eventually being permanently owned by the city. It’s actually for sale, so if you are interested go to http://www.ronaldrae.co.uk/sculptures/lion-of-scotland. 4. 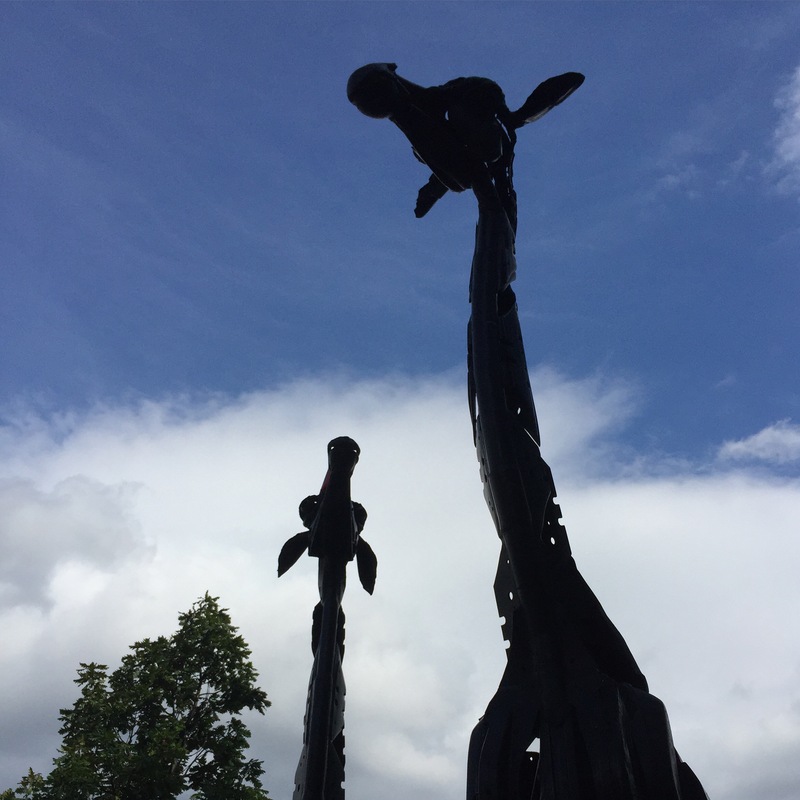 Dreaming Spires, Helen Denerley, 2005, Greenside Place, Leith Walk These giraffes, made of recycled metal, stand outside Edinburgh’s Omni Centre. 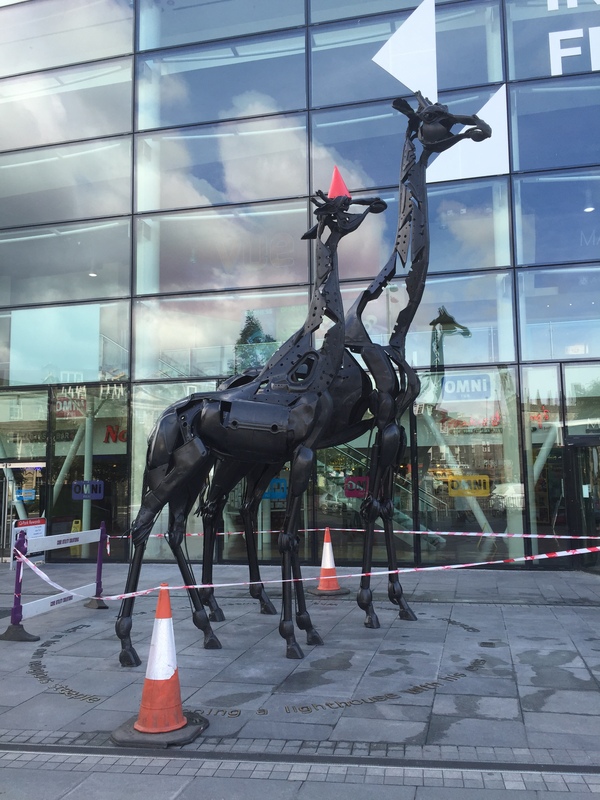 On the day I visited, the giraffes were surrounded by tape and the smaller giraffe had an orange cone on its head, probably as a result of over-enthusiastic visitors to Edinburgh Festival. Find out more about Helen Denerley’s work at http://www.helendenerley.co.uk/. 3. 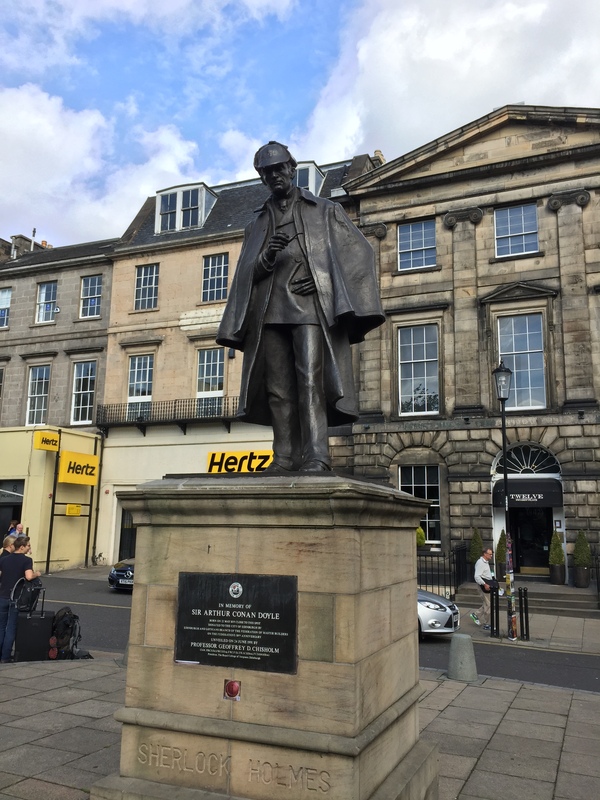 Sherlock Holmes, Memorial to Sir Arthur Conan Doyle, Gerald Ogilvie Laing, 1991, Picardy Place Sir Arthur Conan Doyle was born close to the spot where the statue of his most famous creation now stands. I assume that when it was unveiled it had a commanding view across Picardy Place and could be seen by passing cars. Unfortunately, the vegetation in front of the statue now obscures his view from the road and he has his back to the street behind him. 2. Horse and Rider, Eoghan Bridge, 1993, Rutland Court This striking sculpture sits in a quiet walkway surrounded by office buildings, so probably isn’t seen by as many visitors to Edinburgh as other public art in the city. You almost feel that the man and the horse could break out of their strained pose at any moment and gallop off down the road. Find out more about Eoghan Bridge’s work at https://eoghanbridge.wordpress.com/. 1. 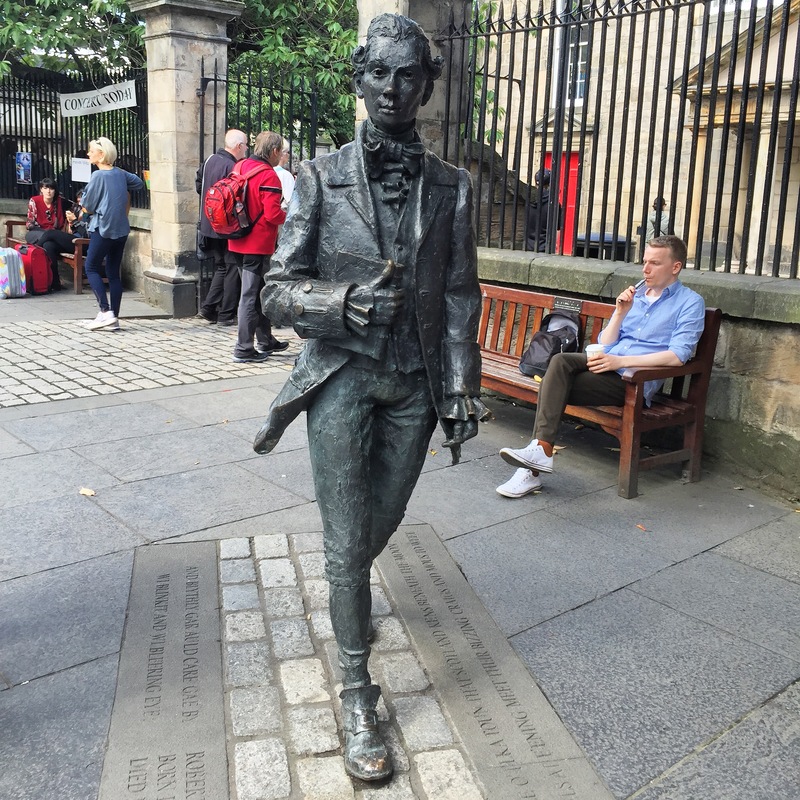 Robert Fergusson, David Annand, 2004, Kirk of the Canongate Edinburgh-born Robert Fergusson (1750–1774) had a short, but influential career as a poet and satirist. 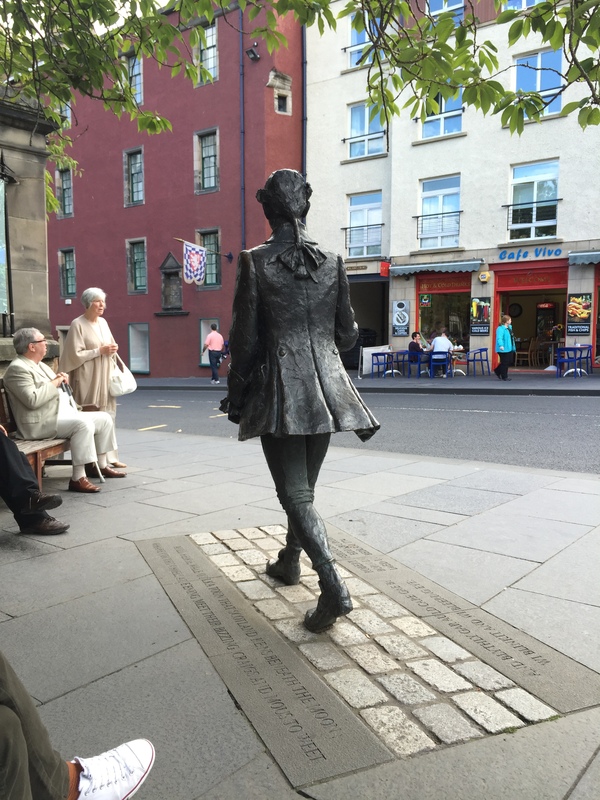 He is buried close to the spot of his life-size sculpture, having died in Darien House (Bedlam) in Edinburgh. Despite the tragedy of his early death, the thing I like about this statue is his jaunty walk and his sense of purpose as he walks along the street. Find out more about David Annand’s work at http://www.davidannand.com/.